The Tricore Ab Trainer Club Pro Cradle is a heavy-duty machine used in over 3,000 gyms and fitness centres.The Ab Trainer Club Pro is preferred by professionals, celebrities, and fitness trainers to get great abs. The Ab Trainer Club Pro is built to surpass your highest durability requirements with 1.25 inch commercial-grade steel tubing. The Ab Trainer Club Pro is a sturdy unit and is designed for heavy use in a commercial health club and will last a lifetime in your home gym. The AB Trainer product line is the most effective exercise equipment for training your abdominal muscles without straining your neck and lower back. There are various abdominal exercises which can be performed with these products to help you obtain '6-pack abs'. The Ab Trainer Club Pro is the “heavy-duty” club version of this immensely popular abdominal workout. It is the perfect compact abdominal trainer that can fit anywhere. The new model includes the Ab Trainer only and accepts your own add on weight plates with 1″ diameter holes. (SOLD SEPARATELY) Includes spring collars to hold weights on securely. The Ab Trainer Club Pro’s rocking action perfectly replicates spinal flexion while completely supporting the head and neck.Manufactured with heavy duty steel tubing and wear-resistant vinyl pads, the Club Pro is built to last. Call 1-800-875-9145 to talk with one of our FitnessZone agents with any questions you may have about the Ab Trainer Club Pro. To significally lose weight and inches order your Ab Trainer Club Pro from FitnessZone.com today! The Ultimate Abdominal Training System! The Ab Trainer Club Pro is the "heavy-duty" club version of this immensely popular abdominal workout. Ab Trainer Club Pro is the perfect compact abdominal trainer that can fit anywhere. The new model includes the ab trainer only and accepts your own add on weight plates with 1" diameter holes. (SOLD SEPARATELY) Includes spring collars to hold weights on securely. The Ab Trainer Club Pro is designed for the fitness enthusiast who appreciates quality. Its rocking action perfectly replicates spinal flexion while completely supporting the head and neck. Manufactured with heavy duty steel tubing and wear-resistant vinyl pads, the Club Pro is built to last. 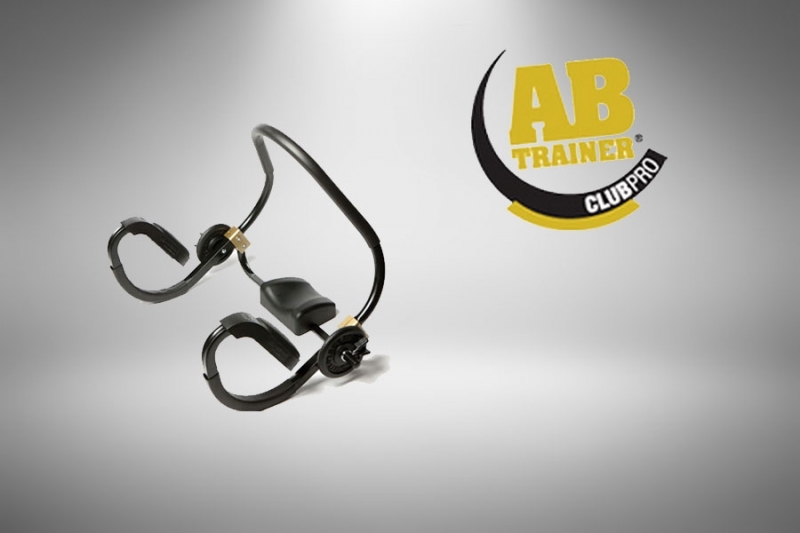 One of the most wonderful features of the Ab Trainer Club Pro is its unique yet simplistic and patented rocker system. You can just “rock” yourself to slimmer abs and great looking waist line. Its unique design results in totally isolated abdominal contraction that is far better than traditional sit ups and ad exercises. It is also a great piece of work out equipment for those who have back or neck problems and cannot work out on their abs to prevent strain on their fragile backs and necks. With the New Improved Ab Trainer Club Pro you can actually do regular crunches, oblique crunches, raised knee crunches, raised straight leg crunches, bicycle crunch and even double crunch or scissor crunch. When you want to really tone your muscles and get into shape with simpler efforts, there is no other product like Ab Trainer Club Pro. AB Trainer® CLUB PRO is a heavy-duty machine used in over 3,000 gyms and fitness centers. This unit is preferred by professionals, celebrities, and fitness trainers to get great abs. Order your Ab Trainer Club Pro from FitnessZone.com today!